A search was continuing Monday for an 11-year-old girl who went missing from her foster home in San Clemente, and who detectives believe may be with her mother. 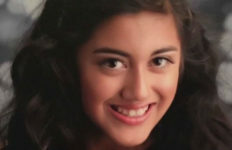 Kaia Fina was last seen Friday and may be traveling with her mother in a black 2007 BMW X3, California license plate 7RRY771, said Carrie Braun of the Orange County Sheriff’s Department. “Although we suspect she’s with mom, we have no confirmation of that,” Braun said. The mother lost custody of Kaia, but she did have visitation rights and there was a visit between the two last week, Braun said. Sheriff’s investigators have contacted the girl’s father, who lives out of state, but they have not been able to get in touch with her mother, Braun said.